Bruno Bucciarati makes his first appearance as a member of the fictional gang "Passione", interrogating Giorno Giovanna about the death of another gang member; "Weepy Eye" Luka. Afterwards, Giorno convinces Bucciarati to help him overthrow the boss of "Passione", in a plot to take over the gang. Eventually defecting from "Passione", Buccellati leads a group of rogue gang members against the boss, who is revealed to be a man named Diavolo. As a child, Bruno was born in a poor fishing village, but he looked up to his father because of the love he had for his family. When his father became mixed up in the drug business and was badly injured, Bruno protected his father from the people that were trying to kill him, by killing them himself. This led him into the world of gangsters. Even though he was a member of "Passione", he had a kind personality; many people came to him for help. 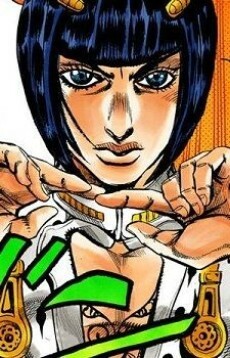 Sticky Fingers is the name of Bucciarati's Stand. It has the ability to place a fully functional zipper with a touch. For example: Sticky Fingers can hit a wall, placing a zipper on it. It can then open the zipper, allowing entrance through or into the wall. Its ability is not limited to inanimate objects; it can be used on humans. Bucciarati is able to use its ability on himself. Its ability can also be used offensively, to take things apart, or to mismatch things. Bucciarati delivers his catch phrase while his Stand beats his opponents senseless with its fists. He begins stringing "Ari ari ari" to its rapid punches, saying "Arrivederci" on finish; "Arrivederci" meaning "Goodbye" in Italian.